For decades the straight line sprint seemed to be the only performance metric that really registered for musclecar enthusiasts, but in recent years that story has begun to change. These days modern musclecars can go toe-to-toe with the most capable sports cars in the world not only at the drag strip but on the road course as well, and technological advances in the aftermarket development have made the task of retrofitting old school vehicles with modern performance a much easier task than it was just a short time ago. Recent years have seen the old cliché that "musclecars can't handle" become a woefully antiquated sentiment. Not only are models like the sixth-generation Camaro ZL1 1LE knocking out Nurburgring times straight from the factory that can embarrass exotics like the Ferrari 488 GTB, aftermarket companies continue to develop new ways to inject modern suspension and chassis technology into older platforms, improving those cars in ways that the original designers wouldn't have been able to decades ago. With road course lap times now as coveted of a talking point as quarter-mile e.t.’s, and series like the Optima Ultimate Street Car Association events proving that domestic muscle can hang with the best Europe has to offer on highly technical tracks and autocross courses, a growing number of musclecar enthusiasts have been looking to broaden their horizons and tune their rides for the twisties. 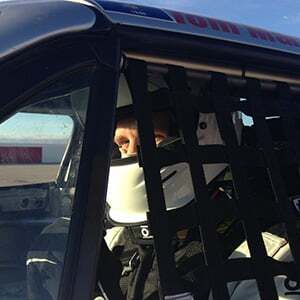 But the reality is that drag racing and track driving are two inherently different motorsport disciplines, and tuning a ride for one of these types of applications can often result in less-than-ideal performance when attempting to put the car to use for the other. So where do you start if you want to set up your ride for road course prowess? After securing the right rubber for your application, the next area that’s likely in need of attention is your suspension setup. F-bodies made prior to the re-introduction of the Camaro in 2010 utilize a solid real axle suspension. While admired for its simplicity and relative light weight as well as its tuning capability for drag racing, solid rear axles leave much to be desired when it comes to ride and handling. Unlike a fully independent system, solid axles function like a seesaw, where the elevation of one wheel when impacting a bump has an affect on the wheel on the opposite side of the car as well. IRS setups, like the Heidts system pictured here, allow each side of the suspension to do its job without interference from the other, thereby maximizing tire contact with the ground and delivering more grip. For pre-fifth-generation F-body owners, the solid rear axle suspension offers some advantages for drag racers dialing in the car to put the power to the pavement at launch, but it is an inherently compromised design when it comes to overall road holding capability and ride quality. Although there’s no shortage of ways to address this while retaining that solid axle through spring, damper, sway bar, and bushing swaps (along with additional bracing for more structural rigidity and perhaps a Watts link), the solid axle design is just not as well suited for the job of high performance handling as a fully independent suspension is. Many a tuner has spent large amounts of time and money fiddling around with the factory hardware before finally arriving at that conclusion – usually after they’ve had enough of the back-battering absence of suspension compliance and the nervous manners of the rear end over mid-corner bumps. Upgrading to Heidts’ fourth generation F-body IRS offers not only potential improvements in road holding and ride quality but stopping power as well. The kit can be optionally outfitted with C4 Corvette brake hardware or Wilwood four-piston calipers – painted either red or black – which are paired up with slotted rotors. The latter should improve braking performance as well as heat management. For folks who’ve already upgraded their rear brakes before doing this IRS swap, Heidts says those components should be able to be paired up with their system without any issues. Still, for years the task of swapping an IRS system into a fourth-generation F-body was firmly in the “attempt at your own risk” category due to the amount of custom work and research required to get it done right. But now fourth-gen F-body owners who want to switch to a fully independent setup can do so while removing the guesswork from the equation by opting for Heidts Suspension Systems’ new independent rear suspension kit for 1993-2002 F-body cars. The kit not only includes all the components needed to make the swap, it also offers customers a number of choices in terms of brake system, third member, and CV shaft components, in turn allowing enthusiasts to tailor the Heidts kit to their specific needs. Here we’re taking a look at the details of the new IRS system, checking out the key points of the installation, and getting some expert insight on the benefits of going fully independent from the experts at Heidts. The fourth-generation F-body system is very similar to the IRS system that Heidts offers for third-gen F-body owners. There are some notable differences though, like the fourth-gen system’s three-inch wider track, and Heidts points out that the shorter third-gen variant could also be installed in a fourth generation car if a customer was so inclined. Doing so would allow for wider wheels and tires to be fit, provided the backspacing of the wheel is adjusted proportionally. The Heidts kit is offered with a Currie third member in a choice of six different gear ratios. That last part is a particularly crucial point to remember for those considering just upgrading their existing solid axle setup for road course driving. Because a solid axle is, well, solid, it works like a seesaw to some degree. As a result, road impacts on one side of the car can affect how much grip is available on the other end as the axle is forced to move upward while sending the other end downward. Available in standard (500 hp) and high power (800 hp) versions, Heidt’s fourth-generation IRS kit shares a number of similarities to their third-generation F-body kit with the exception of the fourth-generation system’s three-inch wider track width and the addition of traction control and ABS provisions. The kit provides an all-in-one solution for would-be suspension swappers, offering optional brake systems that include factory-style stopping power either in the form of the C4 Corvette’s caliper and rotor combination or the C4 caliper with Wilwood slotted rotors, as well as Wilwood four-piston calipers with slotted rotors, which come with or without the parking brake assembly and with the calipers painted in your choice of either black or red. Heidts standard IRS system is designed for cars making roughly 500 hp while the high horsepower variant is suitable for vehicles making up to 800 hp. One of the key differences between the two can be found in the CV shafts – the standard kit comes with 27-spline hubs while the high horsepower version utilizes beefed up CV shafts with 33-spline hubs. Either version can be optionally outfitted with traction control sensors. “Our new IRS has more travel in the shocks and offers a greater amount of camber adjustability [versus a GM setup],” Diedrich tells us. “Using a traditional outboard brake [as we have with this kit] also allows for larger brake options then the traditional inboard IRS brake. All Heidts fourth-gen IRS kits come with single-adjustable coilovers with 10-inch springs as standard, allowing customers to raise or lower their vehicle to taste. The sway bar is adjustable as well, featuring three different end link mounting holes. Which set of mounting holes are utilized will have an effect on the chassis's bias toward oversteer, understeer or neutrality. Using the link most toward the front of the car softens the sway bar rate, while the furthest to the rear stiffens the sway bar rate (the center mounting point is the default). We'd recommend starting with the default mounting locations and adjusting to taste after getting a feel for the system. Heidts’ fourth-gen F-body IRS system also offers a measure of flexibility for people who already have done a brake upgrade and would prefer to reuse their existing brake components. “That should be not be an issue with this kit,” says Diedrich. “The kit comes standard with the cradle, standard or high horsepower CV shafts depending on the customers need, IRS uprights and adjustable billet coilover shocks and springs. Along with the available brake package upgrades, our kits use a 9-inch third member, and we offer a number of different options for those as well.” Six different Currie third member options are available in total, featuring final drive ratios ranging from 3.00 to 4.11. 500 horsepower-rated CV shafts with 27-spline hubs are included as standard with the base kit, and a TCS sensor is optional on this setup. For high-horsepower builds, Heidts offers beefed up CV shafts with 33 spline hubs, either with or without a TCS sensor. 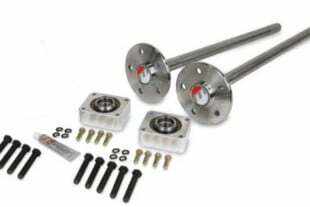 Single-adjustable billet coilover shocks with 10-inch springs are standard with all kits as well. You will need access to a two- or four-post lift in order to do the swap. If you’re using a four-post lift you will need to place the car on jack stands, remove the rear wheels and verify that the vehicle is level, and even with a two-post lift you should still check to ensure the vehicle is level before getting started. The stock rear axle, torque arm assembly, lower rear control arms, shocks and driveshaft are the first items to go, after which you can drain and remove the gas tank and plug the associated lines. Since there’s some cutting and drilling to be done along the way, Heidts’ instructions implore installers to follow one basic rule for successful installs: measure twice, drill once. Heidts offers a basic rule for a successful installation: measure twice, drill once. They also recommend waiting to paint or powder coat any suspension components until you’ve had a chance to trial fit all the components. They recommend having a rotary spot weld cutter handy, as you will need to remove the inner sheet metal panels once the old suspension is out in order to access the frame rails. You’ll also need a die grinder to cut off and remove the panhard bar mount, as the mount will not be used with the new IRS system, along with a spot welder to fill in those holes before grinding them down to be flush with the frame rails. Assembly of the third member is pretty straightforward – just be sure to follow the steps outlined and note the proper torque specs for the various fasteners, all of which is outlined in the instructions. Obviously the addition of an independent rear suspension will necessitate the need for a custom exhaust system as well. However, this does free up a little bit of room since the new exhaust will be routed under the rear end center section instead of over the axle as in the stock fourth-gen F-body setup. Heidts uses the same cradle and center sections for both the third- and fourth-generation F-bodies. The arms, CV shafts and hubs are the most notable components that differentiate the two kits. Here you can see two different installs done at the Heidts shop where the exhaust system has been routed under the pumpkin. With the center section elevated from the lower control arms rather than being the lowest point in the assembly (as it is with the factory solid axle setup), packaging and ground clearance for the exhaust isn't a big issue. Although it’s not a job one can knock out in a leisurely afternoon, the instructions provided remove any guesswork from the equation and include information for all the available brake systems as well as recommended alignment settings. “Folks who have any questions while installing the system are always welcome to give our techs a call too,” says Diedrich. Looking to transform the handling prowess of your fourth-generation F-body while improving its ride quality at the same time? Skip the hassles and the guesswork by bringing that rear suspension into the 21st century with a Heidts Suspension Systems IRS kit – an all-in-one solution for folks who’re looking for a proven formula to get better handling from their ’93-2002 F-bodies.